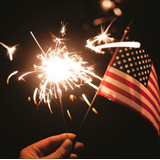 This Independence Day, add some casino fun to your 4th of July fireworks, parades and barbeques! Intertops Poker and Juicy Stakes are adding 20 free hands on casino games this July 4th. They’re also giving a $50 bonus to players that win the July Casino Quest. In addition to their busy poker rooms, Intertops Poker and Juicy Stakes also offer slots and table games from World Match, Lucktap and Betsoft. To collect their twenty free casino bets, players simply play any of the Lucktap games such as Blackjack, video poker, Caribbean Stud and Casino Hold’em. Each player will get 20 free bets, each worth $1, and can win up to $250 in free bet bonuses. There is a 15X wagering requirement on free bets. Poker rooms giving free blackjack and video hands; players that complete July Casino Quest get $50 bonus. Later next week, players can win another $50 by conquering the July Casino Quest. Players that hit a designated set of Blackjack and Video Poker hands (Aces and Faces, Deuces Wild, Tens or Better and Double Joker Poker ) will be credited instantly. Natural Blackjacks and Clubs Blackjacks as well as straights, two-pairs and a Full House in video poker are required to get the July Casino Quest bonus. Players from anywhere in the world are welcome to play poker, slots and casino table games at Intertops Poker and Juicy Stakes.